Mile Square Park is located in Fountain Valley, CA. This lake is stocked by the DFG with Rainbow Trout and Channel Catfish every other week depending on season. Lake also has some carp, bluegill, and a few largemouth bass. 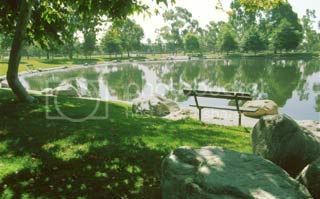 Mile Square Regional Park is located in the City of Fountain Valley. To reach the park, take the San Diego Freeway (#405) to the Euclid offramp. Head north on Euclid to the park entrance. Or take the Garden Grove Freeway (22) to the Euclid offramp, and head south on Euclid to the park entrance. Open: Nov. 1 - March 31, 7:00am to 6:30pm. Open: April 1 - Oct. 31, 7:00am to 9:00pm. Office Hours: Mon. - Fri., 8:00am to 4:30pm.